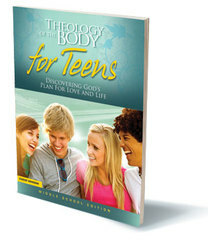 by Brian Butler, Jason Evert, Colin and Aimee MacIver The Theology of the Body for Teens: Middle School Edition Student Workbook presents the revolutionary teachings of Blessed John Paul II to middle school students in a way that is relevant, easy-to-follow, and entertaining. It follows the 8 segments presented in the Theology of the Body for Teens: Middle School Edition DVD Set and Leader’s Guide. Each participant of the program should have a Student Workbook. The Middle School Edition Workbook includes: •Lesson Overviews •Suggested Prayers •Story Starter Activities •Comprehension & Discussion Questions •Bridging the Gap Material (Relates Lesson to Students) •Work It Out Sections (Applies the Lesson to Students) •…and much more!